The exhibition will showcase new art by local Cooktown artists portraying their connection to our unique environment. Oils, acrylics, pastels, mixed media, fabric, silk, fibre, ceramic, photography, digital art and much more! All art is FOR SALE at affordable prices! The 'Cooktown Creations' Exhibition became a possibility when the Cairns Council made the C.1907 Contemporary Art Space available for artists to book to hold exhibitions. This inspired the members of the Cooktown School of Art Society to begin new art works to display in Cairns. We all saw this as an opportunity to promote talented local artists and the community of Cooktown and Cape York to the wider Cairns area. To date we have at least ten participating artists who will be displaying new works in a variety of styles and mediums. We'll have paintings in oil, acrylic, pastel, mixed media as well as fabric, silk, fibre and ceramic art. Photography and digital art will also be represented. Each artist will be portraying their connection to our unique environment. I loved drawing and painting as a child. In the 1980s I started painting classes for a short time until we moved to an area without painting classes available so I took up pottery for five years. After arriving in Cooktown in 1999 I was able to resume painting. I feel at the beginning of the learning process. I just love to paint and wish I had more time to improve and bring to life what I see in my mind. I get such a thrill when someone appreciates a work of mine enough to buy it. This inspires me to continue. I use oil, acrylic, pastel and mixed media and paint in a representational style though more recently I've been creating more contemporary semi-abstract works. I took up the brush and started painting about eight or nine years ago. Before that I used to work with clay and was a fairly dedicated potter. After moving from Railway Avenue into Cooktown I decided to try my hand at painting and found it a quite relaxing pastime. Trying the mediums of acrylic pastels and oils I started producing representational works, some of which I was quite pleased with. I am happy if the works sell,and also happy to pass on and share my interest at weekly painting get-togethers at the Cooktown Community Centre "Red Pepper Art Group" on Wednesdays between 2 and 4pm. 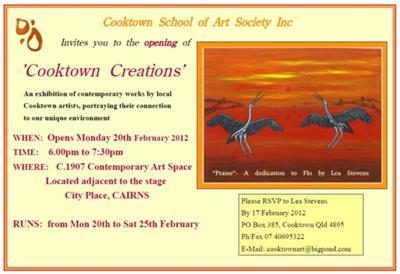 I'm a member of the Cooktown School of Art Society and also Cooktown Creative Arts Association, which is housed in the old Cooktown Railway Station building in Charlotte Street. I was born in 1965 in Atherton, on the North Queensland Tablelands. I am one of six daughters and two brothers of Tennyson Stevens and Angeline Davis. Dad was born on Palm Island and is from the Barbarum and Yedinji nations and Mum is from the KuKu Yalanji and Guugu Yimidthirr nations and grew up at Mossman Gorge. Dad's work took us to many small towns throughout the north. In 1984, after my first child, I moved to Cairns where my Uncle Joe and Aunty Betty encouraged me to paint boomerangs and clapsticks. This was the first time I got to learn anything about Aboriginal Art and the tools that our ancestors used. I loved going to the workshops, where I observed my older cousins and other local murries making and painting these artifacts. My Uncle and Aunty also ran their Aboriginal Arts and Crafts shop called Anuaka where they sold all their art work. Twenty four years later I picked up a paint brush and started painting on canvas and now have the opportunity to share my visions of Far North Queensland with the rest of the world. As an avid gardener and beachcomber I use harvested beach combings and garden materials to create fibre baskets, sculptures and wearable art. I first became fascinated with art at school and later in the age-old techniques of basketry. I find an endless source of creative inspiration in the many and varied natural fibres found locally. In 2007 a wearable art work of mine titled Spirit of Beach and Forest was shown in the Vera Scarth Johnson Gallery in the Recycled Art Exhibition were it won first prize. A photo of a 3D fibre art work titled 'The Snag' was published in Artists Palette magazine. After attending a Judy Pomroy mixed media painting workshop in Cairns in 2010 I produced several paintings that were well received and speedily sold. Prior to this I had only ever done one other painting! Having attended a number of RADF funded workshops at the Cooktown School of Art over the last few years, I have been exposed to a number of mediums and spent some time experimenting with each. It was, however, the pastel workshop that really got me hooked and now pastels is really all I work with. I love creating the colours and layering them to create depth, texture and tone. The rich Cooktown landscape provides a plethora of subjects and I like to experiment, particularly with rocks on our local beaches because they are majestic; ancient, huge and embedded with colour. The wildlife too is wonderfully close. We built a perch in the front yard and now are visited by a family of Whistling Kites who swoop for their supper and provide me with some wonderful poses. Ironically though, it’s portraits that I spend a lot of time doing; commissions mostly for friends and I hope that the examples below speak for themselves. I have always had an interest in art and creativity. With an initial emphasis on lead lighting and mosaic work. I have attended workshops, tried out ideas and techniques always looking for inspiration. Fellow artists have offered constructive critiques and advice on techniques and I have learnt a lot by watching other artists. I find inspiration in everything around me and see everything as a possible piece of art and experiment with several mediums to achieve what I am trying to express as an artist. My art work has progressed to the point where my art sales are increasing. I have also won an art award for an entry in the Cooktown Recycled Art Exhibition in the category of Environmental Art. With each artwork I aim to create something unique. If I can challenge myself and provide interest for the viewer I will continue to enjoy creating art works. I have always had an interest in art and creativity. With an initial emphasis on acrylic painting I have watched other artists or attended workshops and tried out ideas or techniques, always feeling my way and looking for inspiration. Within the art society members have freely offered constructive critiques and advice on painting techniques. I have learnt a lot by watching other artists. With others help I have opened my mind to experiment with paint and not to be so anxious about rules. Above all, plenty of 'brush time' is the true teacher. I have attended art workshops in Cooktown by Greg Dwyer, Linda Jackson, Ludij Peden, Maxine Thompson, Ross Franzi, Sherril Inwood, Trevor Maudsley, Waratah Nicholls and Elizabeth Johns. Each has something to offer and though their methods, techniques and art philosophy differ, they are all wonderful teachers and willing to guide an immature artist towards excellence in art. More recently I've became interested in other mediums such as graphite, pastel, oil, mixed media and digital art. Inspiration for my work stems from people, community and nature. My styles vary from traditional representational to impasto abstract or contemporary. Diana is a multi-media artist and award winning fabric artist. Photographic art - Leena lives in Rossville in Tropical North Queensland. The subject of her photos vary widely from little things in the backyard to the natural landscapes and beauty captured while traveling around the world. Please see www.cooktownart.com.au for more information about these artists.